Sometimes the wait is better than the outcome. The official start of 2018 was scheduled to be on August 20th, but thunderstorms in the state and particularly in the Chicago area caused meet officials to postpone things. On Tuesday, several top teams were able to "bust the rust." Recap: This may have only been a quad meet, but it is was still filled with tons of talent who competed for more than just a tune-up or time trial. Isabelle Christiansen took home the individual title with a solid time of 17:50 for the O'Brien Park course. The host team, 3A #4 Downers Grove South, was the real story as they showed dominance with an amazing score of only 22 points. They had a 1-5 split of 50 seconds and their 6th runner, junior Erin Reidy was not far behind. DGS had an unlikely #1 as we saw senior Melissa Weidner, lead the charge for the Mustangs. Recap: The season opener was festive for all involved and it was business once the gun sounded. The host Downers South and visitor Naperville Central battled virtually step for step for the three-mile distance. Thomas Shilgalis packed it up through the early going, but eventually pulled away for the easy win. "I think [my splits] were about 4:58, 5:06, 4:57," Shilgalis stated afterward. "We went out at a decent pace then I just chilled with [Eddie] Siuda for a while 'till he dropped back somewhere in the 3rd mile. I just picked it up the last 800 of the last mile which was still super smooth. I don't think any of it was completely race effort. It was overall just a fun competition." Recap: This was a close race on the individual side as Jenna Couwenhoven only won by 6 seconds over Lockport runner Madison Polinski. The Lockport girls impressed with a 1-5 split of only 30 seconds. Their 1-7 split was not as impressive as it was a 1:22 split. As we previously stated, Polinski was Lockport's #1 runner and she was trailed closely by her teammate, Akexandra Skibicki, who was only 2 seconds behind her teammate. Recap: New course and design that host Lockport hosted on their school campus instead of nearby Dellwood Park. The distance was reported as three miles. Tyler Cushing was many pundits prediction to win this race, but the win did not come easy as he was getting hunted down near the end of the race by Lincoln-Way Central runner Jared Kreis. Both of these individuals had a great time for the hilly 5k course that may be the hardest course to run on in the land of Lincoln. The real story here is about the dominant performance that Sandburg had as a team. They had a 32-second scoring split and a 47-second 1-7 split. They also had an unlikely #1 runner at the meet as Ben Giblin was Sandburg top man running a 16:13.2 to take 3rd place, he was followed by his twin brother, Will Giblin, who ran a 16:13.9. Projected #1 runner for the Eagles, Nico Calderon, ended up being the teams forth runner that day. Recap: Lianna Surtz impressed many people as the pre-season hype pre as she dominated the field by 21 seconds! 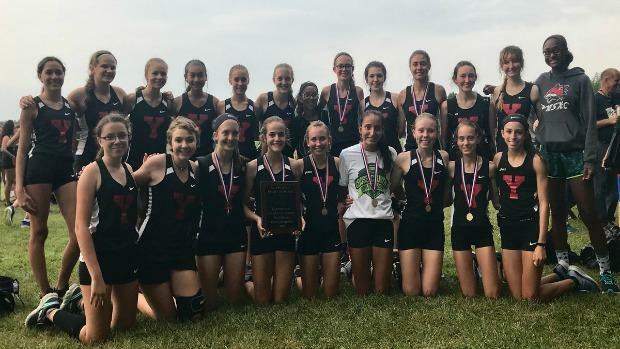 #2 Yorkville opted to not run one of their top returning runners in senior Emily Eberhart, but the bold decision didn't seem to hurt them. The Foxs were led by the great performances of Olivia Borowiak, Helena Kleronomos, and Kailey Fox who took 2nd, 3rd, and 4th place. Their 4th and 5th runner were farther back as the Foxes 1-5 split was 1:40. The verdict: Thomas Leonard was the main attraction here as he dominated the field by 37 seconds and easily took home the individual title. The team side was weaker as Yorkville easily took down the field. Ranked Oswego East was there, but they opted not to run their top 5 runners. Sophomore Nick Henz lead the charge for the Wolves with a time of 16:25.1 and a 6th place finish. It showed that they will have some depth this upcoming year.